Sorry, but I have to disagree with you on your Mac Musings article about the Edu-only-iMac. Combo drive. The prices of Combo and SuperDrives are so close these days, it's not worth (IMHO) to use a Combo drive. Not to mention, an upgrade to a SuperDrive isn't even available. Strike Three: Combo drive. No upgrade option. Now, add on iWorks and AppleCare (which I refuse to buy a Mac without), and we have a total cost of $1,207. Compare this to a standard, education iMac, with 1 GB RAM, iWorks, and AppleCare: $1,457. Yes, the iMac with ATI Graphics costs $250 more, but for performance and specifications, I'd say it's money well spent. I'd hate to be a school student using one of these edu-iMacs, un-upgraded years from now in elementary or middle school. You make some good points, Ian. For performance reasons, I wouldn't set up a new Mac with less than 1 GB of RAM. That's a low-cost upgrade, and you'd probably do it with either version of the iMac. At that point, losing 80 GB for video isn't much of an issue. Apple didn't choose an 80 GB drive because of the cost per GB but because the cost of the drive is lower than a 160 GB drive. Again, I'd drop in a big, fast third-party SATA drive rather than have the Apple Store do it. And I'd do the same with a 160 GB drive. 250 GB would be nice, but it would increase the price. Apple charges $50 to upgrade the Mac mini from a Combo drive to a SuperDrive. I'm surprised they don't offer that option, but there are third-party SuperDrives for those who want them. But at that point, the difference drops to well under US$200. As for AppleCare, the cost is the same regardless of which iMac you buy, so that's a wash.
Apple was shaving dollars to get the price of the edu-iMac as low as practical. That's why the 80 GB hard drive and Intel graphics are there, along with the Combo drive. While it would be nice to have a bigger hard drive and a SuperDrive, that would have made this a $999 model for the education market - and iMacs are already expensive compared with cheap (and often cheaply made) Windows PCs. I think the edu-iMac is a valiant effort to provide an all-in-one solution to the education market, and I don't think the compromises are unreasonable. Hi Dan, did you include the price of the SuperDrive DVD burner when comparing prices between the Education and Retail 17" iMac? I just gotta have my DVD burner! I even installed a SuperDrive in my old eMac 700 (not that hard compared to installing an Xceed color video card and Daytona 33 MHz 68030 accelerator in my old SE/30 more than a decade ago). When I first got the eMac and saw it had a 40 GB hard drive, I said, "awww, we'll never fill that up." Famous last words! So I really like the large hard drive in our new iMac. I don't know if I would've ever noticed the "vampire effect" since I'm just a regular user who doesn't need Photoshop or such high-power programs. We just use it for Web browsing, email, and Office, that's about it (with an occasional game - have you tried the Call of Duty 2 demo yet? Cool!). After using the 700 MHz eMac for so many years as our only home computer, this Intel Dual Core and 128 MB of VRAM makes for quite a speed upgrade, wow I love this new iMac! (I already installed a 1 GB RAM DIMM). No, I didn't include $50 to upgrade from the Combo drive to a SuperDrive (which Apple doesn't seem to offer anyhow). If that's important - and I can't recall the last time I burned a DVD - that comes to a $175 saving with the new edu-iMac. The less powerful graphics processor will only make a significant difference for 3D games, something I have no interest in. I spend enough time working at my computer; I don't want to play with it. As for "vampire video", its only going to really impact Macs with 512 MB of memory, because you lose about 15% of your RAM (80 MB) to video. Once you get to the 1 GB mark, there's a lot less impact. I am Houlton, the old Portable duck. My hobby for many years has been repairing and reconditioning the original Mac Portables M5120 and M5126 and you have kindly listed a link to my Portable pages for years. Thank you. As you well know, vintage technology is catching on. Several weeks ago I sold and delivered a Portable to the assistant manager of the Apple Store at Stanford, California. I walked it in to the store, handed it over to its new owner, and he asked me to set it up and show him its paces. So we made some space on the fancy counter among the other Apple hardware and fired her up. What an image: There among the latest stuff was a Portable with Missile Command running in full glory. Both Apple employees and customers crowded around. The comments from the gallery included such as: "What is that?" and "Hey, I remember that game." A good time was had by all. I think the assistant manager was glad to have her. I was as proud as a new Papa. Even the fancy new hardware seemed to beam its approval. I felt like I was finally giving something back to Apple. That same day I sent off another Portable to the Infinite Loop itself. Not to any of the powers that be, mind you, but rather a sales guy - a working stiff like the rest of us, but still. Once again, the pride and satisfaction. I thank them, I thank you, and I thank the Portable models for the pleasure they have given me over the years. They still hold my interest and affection. Your page is both a joy and a source of information but, um, do you really think these fine venerable ladies are "Road Apples"? Thanks for writing, Houlton, and for keeping so Mac Portables alive and kicking. I love the Mac Portable with its full-sized keyboard, monstrous trackball, and incredible battery life. For its era, it was fast, had great memory expansion, and the active matrix display was one of the finest ever used. On the negative side, it was huge, heavy, and used an oddball hard drive with a proprietary connector. The Portable was an awesome portable Mac, but people kept trying to compare it to DOS laptops instead of things like the SE/30 and Mac IIci. The Portable was a battery powered desktop computer, and there wasn't a big market for that type of computer. 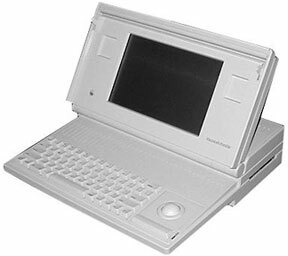 Much as you, I, and others love the Portable, it merits the "Road Apple" designation not because it's poor hardware, but because it was a no compromise portable computer that was simply too large and heavy to be very portable. I would like to either recycle or donate my beloved but unused 1986 Mac Plus and all its accessories. Does this computer have any value at all to anyone? I'd even ship it somewhere if it were to be used. Or should I simply recycle it? The Mac Plus has something of a cult status as the last quiet Mac - no fan, no internal hard drive. With System 6 on a floppy, it's relatively popular as a writing machine. In terms of monetary value, though, you're probably in the $5-20 range. You might try joining our Swap List and posting it there. And if you can find someone to do local pickup, you avoid the hassles of packaging and shipping. First off, I want to say that I love Low End Mac and read it just about every day. I noticed that you're wondering some about SheepShaver. I'm using it on my MacBook Pro, and it works fairly well running OS 8.6. It is unstable, though, and crashes fairly frequently. iCab 3.0 beta crashes the thing routinely. Even ejecting a CD will sometimes bring it down. While OS 8.6 boots incredibly fast, performance otherwise is somewhat lacking for some software. It's slow with PowerPoint 2001 but alright with Word. The pinball game I have partially runs absurdly slowly . . . the flippers, etc., run just fine, but the ball moves ridiculously slowly. An upside of this is that it's very, very easy to run up extremely high scores if one has the patience to play the game. I haven't done much else yet with SheepShaver. For me, at the moment, it's just a toy. Google took me to LEM to locate AIF to MP3 decoder software for OS 8.6. Yahoo also took me there. I do not see any decoders of this type on the website. Only MP3 players. Interestingly, many search engine results which state 'aif to mp3 ' prove to be very inaccurate. I haven't determined why! Can you refer me to an AIF to MP3 decoder for OS 8.6? All feedback is appreciated. What exactly are you looking for, Jim? If you want a program to convert AIF/AIFF/WAV files to MP3 format, there are quite a number of programs to do that. I suggest you read Nathan Thompson's Embracing Obsolescence columns on ripping CDs and setting up a Mac jukebox. The only reason you would decode an MP3 file would be to listen to it or convert it to another format, such as the AIFF tracks. With your need for a program that works with Mac OS 8.x, I'd suggest you look into SoundJam, the ancestor of iTunes that runs on any PowerPC Mac with OS 8.1 or later. Mathias, you're very welcome. I spent months (on and off) trying to figure that one out, and I was pretty sure someone, somewhere would benefit from the solution.